Featuring the same bright, open design as Ceramic Studio: Hand Building, this second entry in the series offers an introduction to the mechanics of wheel-thrown ceramics. Artist Emily Reason takes beginners through nine projects, including a mug, pitcher, teapot, and fluted baking dish. Starting from one of two fundamental forms (cylinder or bowl) she covers such basics as centering, pulling a handle, trimming, firing, and glazing. Color bands throughout point the reader to related information on various techniques, while gallery sections provide inspiration. 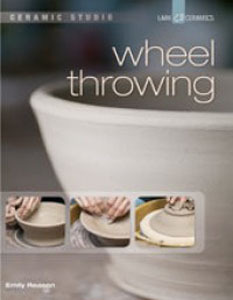 This book was formerly published in hardcover as Ceramics for Beginners: Wheel Throwing. Emily Reason received her Bachelor of Fine Arts, concentrating in Ceramics, from West Virginia University in 2002, and has completed resident artist programs at Odyssey Center for Ceramic Arts in Asheville, North Carolina, and the EnergyXchange, a crafts business incubator in Burnsville, North Carolina. Emily's work has been exhibited at the Philadelphia Museum Craft Show, Smithsonian Craft Show, NCECA Clay National Exhibition in Baltimore, and more. She currently works as a full-time potter, teaching classes and workshops in wheel throwing.